Terralift - repair your septic system - T.W. Ammons Septic Service, Inc. 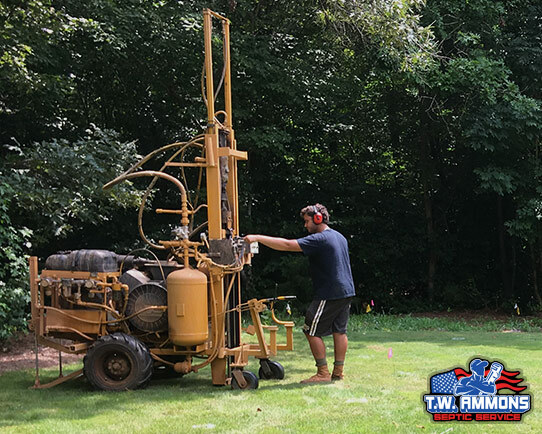 Originally developed to help deliver water to tree roots, the Terralift was later tested and is now a state approved method of repairing a failed septic system. 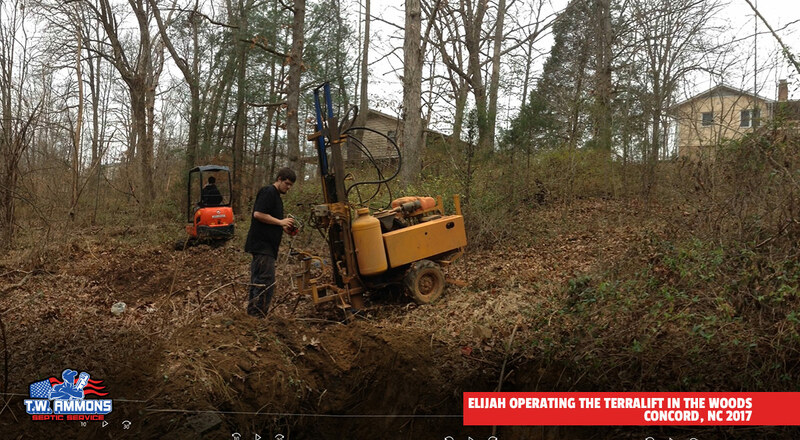 The Terralift is a machine that bores a probe into the ground around septic system drain field lines. Once bored, the probe delivers pressurized air into the soil and along the drain field wall. By fracturing the soil around drain field lines, the Terralift can fix soil compaction and saturation. All without damaging your yard. The Terralift is brought onto the septic field and the probe is bored into the ground next to the drain field lines. 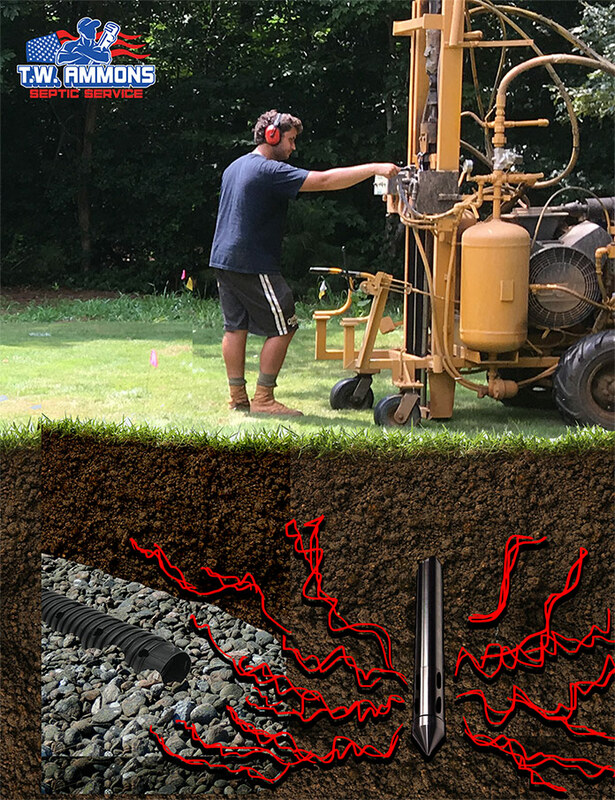 Once the depth of the probe matches the drain field, holding tanks transfer pressurized air through the probe and into the ground, fracturing the soil. We refer to this as “blasting” the lines. Along with pressurized air, the Terralift also delivers a set amount of small polystyrene beads in the created fractures of the soil. Often called “styrofoam” beads, the rice-grain sized polystyrene beads help in keeping the ground open for extended periods of time, further combating soil compaction and saturation. The fracturing helps to loosen the surrounding soil, along with the drain field walls and its biomat flooring. Biomat is a healthy part of the drain field that over time can become too thick to function as intended. A second blast below the depth of the drain field lines helps to loosen the biomat in the drain field, restoring normal biomat function. Fully blasted, a failed drain field will operate optimally. The surrounding soil, the drain field walls, and the biomat layer are all positively affected. What is a typical repair job with Terralift? On arrival to the job site, the septic system is located and marked. This includes the septic tank, the distribution box(es), and the drain field lines. Any buried utility lines are also noted. The septic tank inlet and outlet is dug up and exposed. The Terralift machine is brought onto the septic field and painted marks denote where the blasting will happen. The blasting takes place along the entire length of the drain field walls. While the Terralift fractures the soil, the wastewater level in the tank is monitored. In some cases a repair job may require the extra excavation of the distribution box(es). My septic is in the woods, can it be repaired? Here at T.W. Ammons Septic Service, Inc. we Terralift even the hardest to repair septic systems. Check out our other services.